Stay on the cutting edge of cybersecurity's evolution and global insight! Subscribe to The Nexus for FREE today! 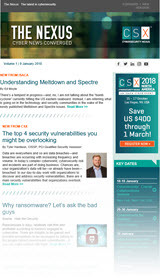 Sign up for The Nexus, the CSX newsletter where all things cybersecurity converge. Receive original thought leadership and knowledge from experts in the field, news and updates from CSX. Leverage the best cybersecurity-related articles from around the web—all delivered FREE to your email inbox monthly. By subscribing to The Nexus, ISACA® may send you information about related events, webinars, products and services that we believe will be of interest to you.